LOWTON, a village and a parish in Leigh district, Lancashire. The village stands 1 mile E by N of Golborne r. station, and 3¾ SW by W of Leigh; and has a post office under Newton-le-Willows. The parish includes the chapelry of Lowton-St. Mary, and comprises 1,824 acres. Real property, £6,148. Pop. in 1851, 2,140; in 1861, 2,384. Houses, 492. The property is much subdivided. Lowton Hall and Byrom Hall are ancient mansions, now used as farm-houses. There is a cotton mill. The head-living is a rectory, and that of St. Mary is a vicarage, in the diocese of Chester. Value of the rectory, £250; * of the vicarage, £127. Patron of the former, the Earl of Derby; of the latter, Miss M. Leigh. The parish church is an old building of brick and stone. St. Mary's church was erected in 1861; is a stone structure, in the early English style; and consists of nave, aisle, and chancel, with porch and belfry. There are chapels for Wesleyans and Primitive Methodists, an endowed school, and charities £50. Details about the census records, and indexes for Lowton. You can also perform a more selective search for churches in the Lowton area or see them printed on a map. The Register Office covering the Lowton area is Wigan and Leigh. Ask for a calculation of the distance from Lowton to another place. "LOWTON, a township and chapelry in the parish of Winwick, hundred of West Derby, county palatine of Lancaster, 3 miles S.W. of Leigh, and 7 N. of Warrington, its post town. The Golborne station, on the London and North-Western line of railway, is about 1 mile from the village. Cotton spinning is carried on. The land is chiefly in meadow and pasture, with some arable and woodland. The tithes hate been commuted for a rdnt-charge of £95. The living is a rectory in the diocece of Chester. The church, dedicated to St. Luke, is an ancient edifice. There is also the district church of St. Mary, a perpetual curacy value £127. The parochial endowments produce about £50 per annum. The Wesleyans and Primitive Methodists have each a chapel. There is a school partly endowed for boys and girls. Byrom Hall and Lowton Hall, formerly seats, are now farms." In 1835 Lowton was a township in the parish of Winwick. 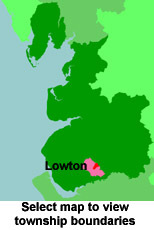 You can see the administrative areas in which Lowton has been placed at times in the past. Select one to see a link to a map of that particular area. View maps of Lowton and places within its boundaries. For probate purposes prior to 1858, Lowton was in the Archdeaconry of Chester, in the Diocese of Chester. The original Lancashire wills for the Archdeaconry of Chester are held at the Lancashire Record Office.